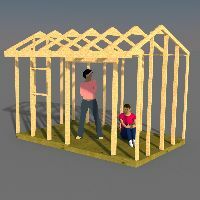 Here are some common shed designs that can be used to build sheds for outdoor storage, garden sheds, tool sheds and small barns, playhouses, small cabins and more. The really neat thing about a gable shed design is that it is super simple to build. 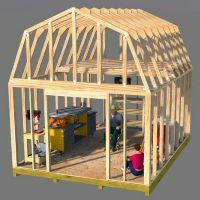 The roof framing is very easy and this style can be used as a playhouse for the kids, storing your garden tools in, or even a small studio office, or just a place to get away and relax in. You can easily add windows, flower boxes, workbenches, and storage shelving, or as many doors as you need because the framing for the gable designs in my plans is very straight forward and a simple task to accomplish even if you don't have that much construction experience. As far as storage in the roof, the gable style is not going to give you a whole lot of storage up there unless you have some really steep roof trusses or rafters. If you are looking for outdoor storage that's going to give you 'lots' more storage for the basic foot print, then the gambrel or barn style shed designs are what you want to build. 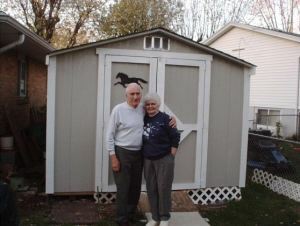 However, if you are looking for a really easy shed to build, the gable style is your best bet. You can find our gable shed designs and plans here. If you want to build a shed that has lots of character and looks great, then the saltbox roof style is what you want to build. This design is a great shed for your garden tools. It will be a little harder to build due to the framing of the roof, but is not that much harder to build then your basic gable shed. Storage in the loft area will not be that great, but you will have room to store some small stuff up there, especially in the overhang area of the roof that extends out past the front wall. Windows, flowerboxes, shelving, workbenches - they are all easy to add inside this saltbox shed. Your wife can do all her gardening tasks inside, and if you build our 16'x12' saltbox, you'll have room to put your riding mower in there too! If you are interested in building the saltbox style shed designs, check out our saltbox styles. Now we are talking some serious storage here! If you need lots of storage for the same square footage, the gambrel style roof is your best option. The loft area is a great place to store lots of clutter you need to get out of your garage. Loft construction in gambrel sheds is not hard, and you can even make the storage room much larger if you drop the floor supports in the loft area down and attach the ends to your upper wall studs. Cost wise, the barn style designs will cost you more, but the added benefit of all that extra storage will be well worth the extra investment. As for the ease of building, well I would say that the gambrel shed is somewhat more difficult then building the gable shed, and about the same as the saltbox shed. Adding all the extras like shelving, windows, even roll-up doors, will make this storage shed one that you will cherish for a long time to come. 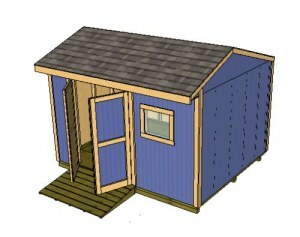 Check out all of our barn shed plans we have right here at shedking.net. This shed design, the lean-to, actually has a 'shed roof'. One roof with a single slope. That is a shed roof believe it or not. 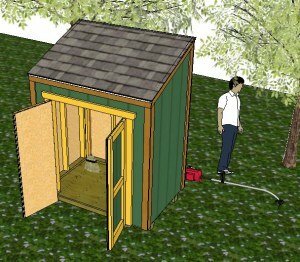 This style shed is very simple to build, won't take that much time, and is a great little storage building you can use to store garden tools in, pool equipment, or just about anything you want to put in it. Another great use for a lean to is storing firewood. We have a nice little firewood shed plan here. 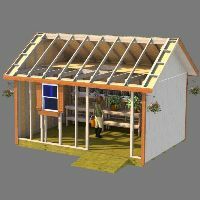 You can check out our lean to shed plans here. It's Not Hard to Build Any of the Shed Designs Above! Building any of the above shed designs will indeed be a fun and worthwhile project for your home. Our plans listed for all the above storage buildings are easy to uderstand, very cost effective (I'm not trying to make a killing here!) and will help you build a nice shed for whatever purpose you may have in mind. Just remember to get the whole family involved. 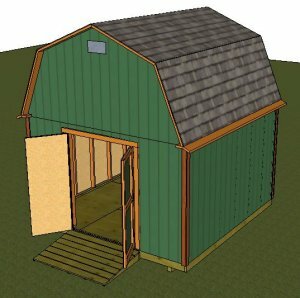 Making your own shed will be a fun and great project for all of you to get involved in. 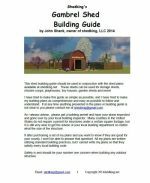 I love putting these shed plans together for visitors of shedking.net, and have lots of information available on the site for designing and building your very own storage building, and all my plans come with email support from me, John, the shedmaster at shedking.net.